We offer you the latest technology in molecular dynamics (MD), which is widely used as a powerful simulation method in many fields of molecular modeling. In contrast with the old-fashioned vision of proteins as rigid structures, structural biology has revealed that they are highly dynamic entities. Anaxomics employs molecular dynamics to reproduce this inherent flexibility in computerized simulations. The molecular structures of proteins that are stored in Protein Data Bank (PDB) are generally obtained from crystals that have a definite, static shape. Therefore, it is necessary to develop algorithms that predict protein motions from crystallized structures, but the calculations required to describe the complex atomic interactions are too computationally intensive for current computers. Molecular dynamics simulations were born to overcome this limitation using simple approximations based on Newtonian physics. Any attempt to recreate protein function has to take into account the existence of multiple conformations for a given protein. 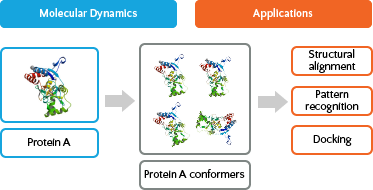 Fully conscious of this need, we at Anaxomics use this strategy to generate multiple conformers before engaging other tasks involving protein structure, such as pattern recognition or docking. You can read more about how we perform molecular dynamics simulations on the corresponding White Paper.